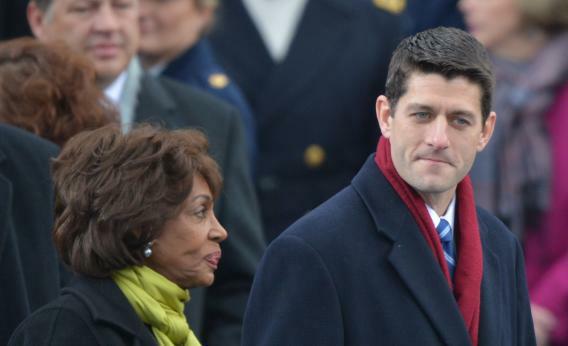 Former Republican vice-presidential candidate Paul Ryan arrives with US Congresswoman Maxine Waters for the 57th Presidential Inauguration ceremonial swearing-in of President Barack Obama at the US Capitol on January 21, 2013 in Washington, DC. It’s a statement of just how driven the current House GOP conference is that the vote for “No Budget, No Pay,” the some-strings-attached debt limit hike, was treated like a landslide. Only 33 Republicans opposed it. Had Democrats withheld their votes, as they did on “Plan B” and other Boehner-saving measures, the bill would have gone down. But 86 of them voted with Boehner (68 more than needed) and the bill passed. And that gave Republicans the flush of victory. The five-minute vote (the House had just gathered to kill a Democratic poison bill, so there wasn’t much time needed) started with a surge of Democratic and Republican votes, quickly pushing the “ayes” above 100. It was clear that members of both parties who wanted to “message” the vote were holding out. Republican whips eyed the vote count (it’s broadcast on the walls of the chamber), and broke into cheers when they passed 217. That started a new surge, of no votes, mostly from Democrats. And it validated the Republican strategy. In his final speech on the vote, Paul Ryan chided Democrats for balking at “their own proposal.” No Budget, No Pay was inspired by a Blue Dog bill endorsed by No Labels. Suckers! As Democrats straggled past the five minute deadline, Republicans – including Majority Whip Kevin McCarthy – yelled “close it!” and “hit the gavel.” Why give them time to cast an easy campaign vote?